Note that Power is "Work per unit time" and work is "Force through distance". In gravity systems the Force is Weight - mass multiplied with gravity. In the SI system the unit of power is watt (W, Nm/s, J/s). SG for water is 1.001 at 32oF and 0.948 at 240oF. The brake horsepower is the amount of real horsepower going to the pump, not the horsepower used by the motor. In the metric system kilowatts (kW) is used. Due to hydraulic, mechanical and volumetric losses in a pump or turbine the actual horsepower available for work on or from the fluid is less than the total horsepower supplied. Engineering ToolBox, (2003). Pumps, Fans and Turbines - Horsepower. 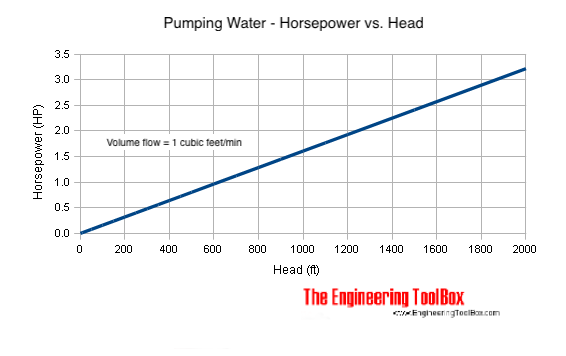 [online] Available at: https://www.engineeringtoolbox.com/horsepower-d_472.html [Accessed Day Mo. Year].